My glider doesn’t match. It doesn’t match because It. Is. Maroon. Recovering this chair is the project that I never got around to before Sweet P was born…or after. All Mamas have one (or more) of those projects. It’s allowed. No, REQUIRED. 1. Babies spit up. A LOT. 2. Colors really don’t make a chair more comfortable. 3. A $60 estate sale find that once belonged to someone who was practically a grandmother to you is much more comfortable and comforting to feed and rock your sweet baby in than the $1500 Pottery Barn model. 5. Knowing that this grandmother figure spent hours praying in that chair (often for you and your family) increases its value tenfold. This glider belonged to my Mimi Rose. A woman who loved me like a granddaughter – so much so that I didn’t realized she wasn’t my grandmother until I was about 5 or 6 years old. 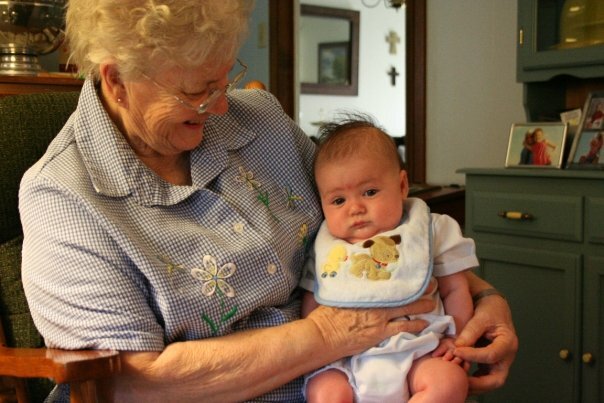 A woman of great faith who prayed me six long hours home from college every Christmas break and countless times in between – and before and after for that matter. A woman of great strength – coupled with a good dose of stubbornness – which really is the best kind of woman, don’t you think? A woman who, though she’s gone from this earth, reminds me daily of the power of Love poured out freely and abundantly. It is only fitting to name the chair after her: The Mimi Rose Chair. 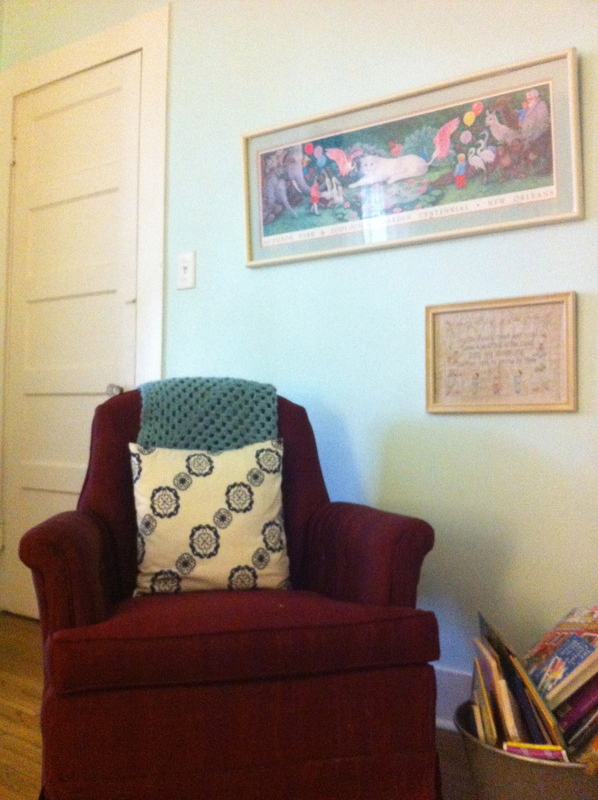 My Mama recently helped me to craft a makeshift slipcover for the Mimi Rose Chair out of a white matelasse blanket. 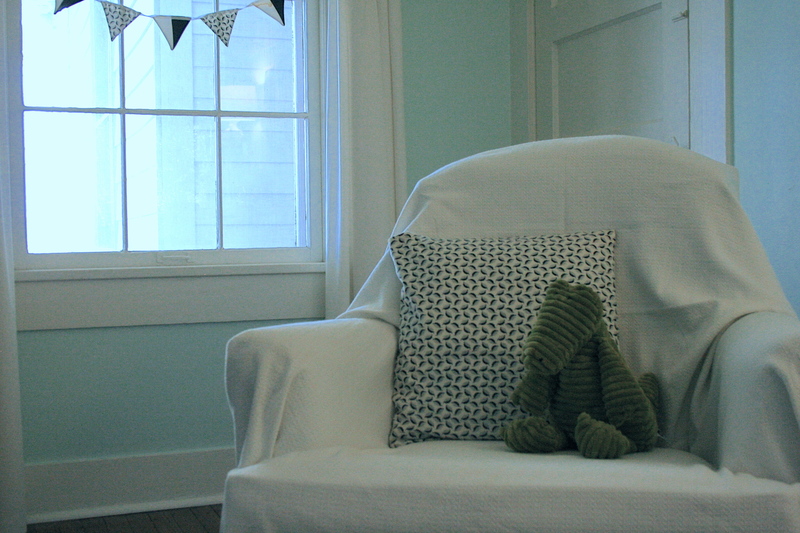 With this white cover, the chair now matches the room, but retains its comfortable, well-worn shape that cradles me and my babies when we rock and read, bringing old memories of comfort and warmth and creating new memories of the same. I’m not sure what it is about chairs and what makes me love them so much. Perhaps it’s the fact that they cradle and keep us, supporting us when we feel too burdened to take another step. As a mother, I can think of no better chair for this purpose, for this journey is hard and long, and often I feel burdened beyond what I can bear. But, the Mimi Rose Chair reminds me that I am loved, that I am supported, that there is rest and peace and calm. I may never get around to recovering it, and I’m okay with that. Rose was a very special lady. I don’t know if you know that Howard and I each had “connections” to her and cared for her a great deal. Love this post! Love this post! What a great lady she was! She loved you very much! What an awesome tribute to her to have a “Mimi Rose” chair!! I like the way the cover is right now—-it’s sweet and practical, and looks great. I wouldn’t change it, because I’m the type of person who would want to peek underneath every once in a while to see the maroon color that Mimi Rose chose, and pat its surface with my hand just to feel the surface that touched her skin. I’m sentimental that way.